This entry was posted on May 12, 2015 by TemplatesMaster. Are you getting excited to hear something new today? 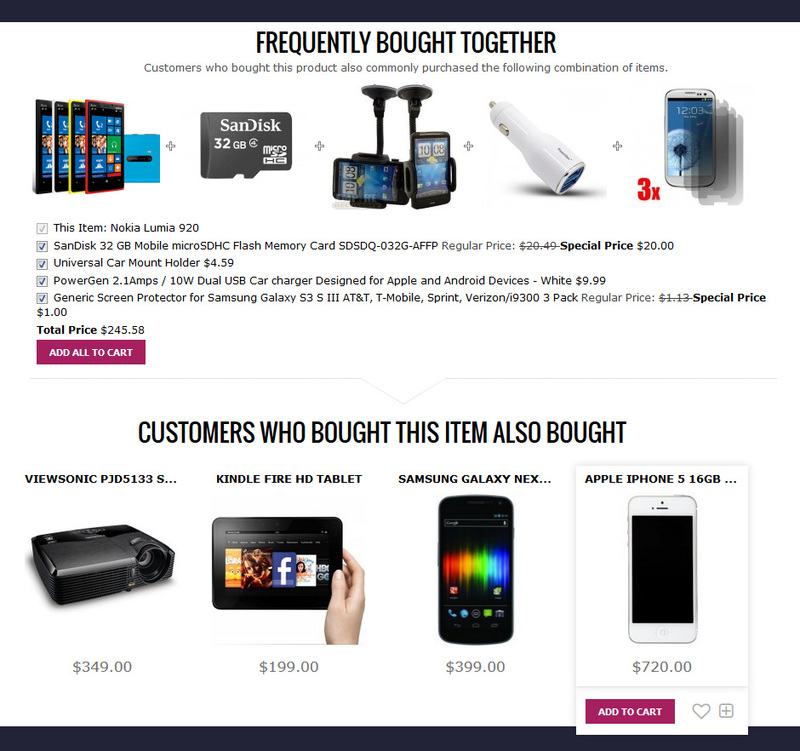 Here is how to provide your customers with the best product page possible. 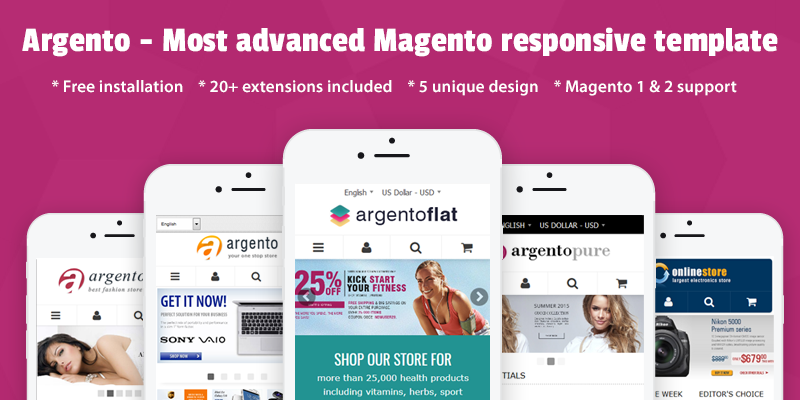 As you already know, the new Magento skin Argento Flat was recently launched. It was preceded by the real e-commerce winner Argento template. People met it in 2013. Magento users who have installed Argento rate it 5 out of 5 stars. 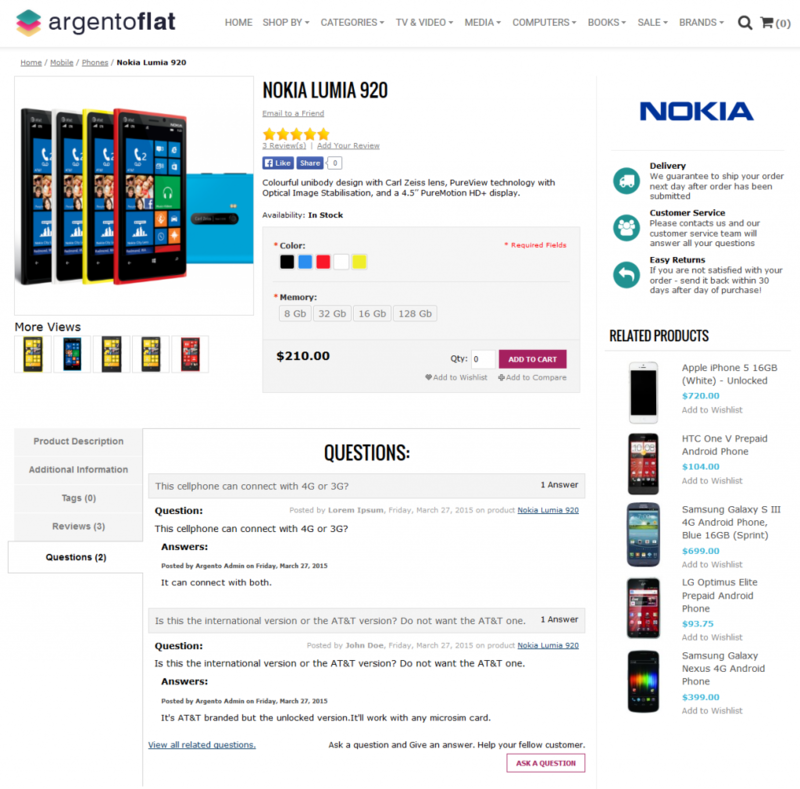 And now we offer you to check out the new Argento Flat theme. No matter what you sell, we created the perfectly-designed template to fit all your requirements! 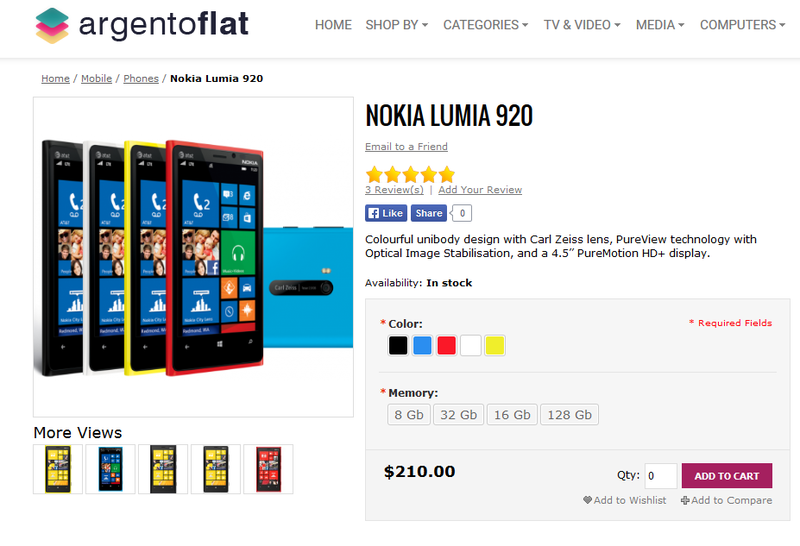 The completely redesigned product page for Flat design will tell much more to your visitors about the product. The page is powered by professional time-tested modules such as Easy Tabs, Ask it, Sold Together, Brands Page, Prolabels, Lightbox Pro and Facebook Like button. All the extensions make the product page really engaging. Your own rich content will make the Flat unique. Let’s find out the highlights now! Flat design is mobile ready! Whenever users access the web, they definitely want to keep in touch with your website. Our Argento Flat has a fully responsive design, therefore it fits all screen resolutions. By allowing your customers to browse your store on any mobile device and by giving them the way of an highly available illustration, you gift your visitors with a much improved online experience. 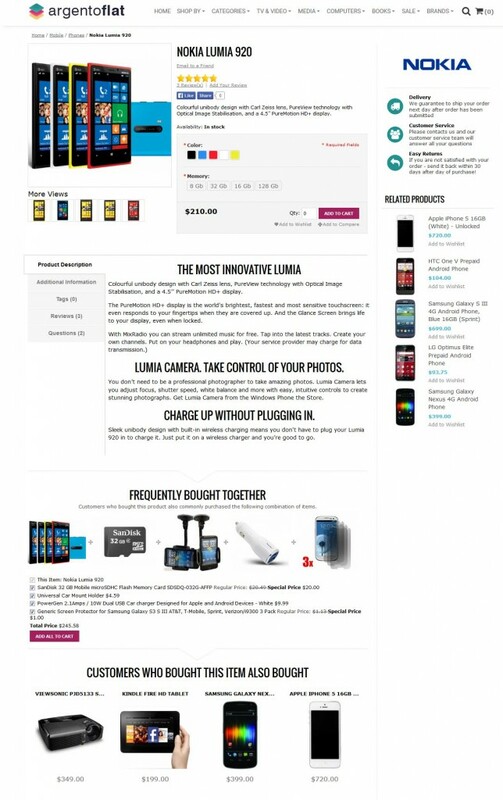 New neat design of the product page will make the shopping process much easier for your customers. We offer some outstanding features for presenting the product’s benefits to customers in the user-friendly way. Let us, for instance, consider the product image display. The carefully selected high quality image is a doubtless way to draw customers attention. Argento Flat includes the Lightbox Pro extension that replaces the default magento image zoom with a lightbox window. The position of the lightbox image is fully configurable. Moreover, you can create an appealing image gallery that will help visitors to make a purchasing decision faster. In order to create the image gallery in one click, please use the Lightbox Pro widget. Follow the path Admin > CMS > Pages and browse gallery images. You can also go Light box pro user manual and get clear user guide. We advise you to take a look at the new attractive CMS block on the product page. It was created during Flat theme installation. You can put any useful content there: tips, delivery or other service information. Want to know how to show the brand logo? You are welcome to check out the Attributes and Brands pages extension user manual. Going to Admin > Templates Masters > Attribute Pages > Manage Pages, you will create the brands page based on manufacturer attribute. Then you can navigate Admin > Cms > Static Blocks and open product sidebar block. You need only to change manufacturer to attribute code, that you are using for saved attributes page. In order to create your own appealing service block, you have simply to go Admin > CMS > Static Blocks and find services_sidebar block. If you’d like change the block on the product page only, please edit the product_sidebar cms block. For better visual performance we’ve used the Font Awesome set of elements in the block so that you can customize icons and colors according to your wishes. You might see the tempting Nokia logo is really impressive! It looks like call-to-action message to clients considering the positive credit of Nokia company. Please notice, the brands emblem can be placed at any place of the page. Apart from logo, Argento Flat enables to showcase the products distinctive feature or benefit. It can be something, that compares favourably with another product. Another improvement of the Flat product page is absolutely bang-up Related products block. It is the default magento block which is fully managed via products’ configuration. We offer you to use the layout of the block with larger product’s images and cleaner fonts. It looks more attractive and visually clear. Why using tabs? Because it is good chance to place a lot of meaningful content without taking up a lot of valuable page space. Keep it short! Let’s tell about the product with the scope instead of simply outline a few products features. Flat design tabs are supported by our Easy Tabs plugin. Tabs are dynamic, absolutely customizable and they obviously fit all screen sizes. You can put whatever content you’d like inside your custom tabs. The content can be taken from CMS static block and from products attribute. You are also allowed to easily add the product questions block by using widget. In order to fully understand how it works, we advise you to check out the Easy Products Tabs extension page. Please pay attention on the Easy products tabs user manual. You can find our use cases for perfect tabs’ customisation there. You can add new blocks into the tabs, create dynamic tabs based on the content of cms blocks or products attributes,etc. Just use tabs in order to add more additional information. That will help customers to finish the purchase of the product. Don’t forget about a trustworthy product description, reviews that maintain rating of credibility and will definitely boost your store sales, and, of course, tags that will make clients find the content on the website easier. Moreover, we suggest you to add the generated content based on the most frequently asked questions by users. Take a glance at Questions tab. It is controlled by the Askit extension, that was integrated with Argento Flat theme. We recommend you to create a knowledge basis in order to help your customers to find questions as well as answers about the product. Visitors are also allowed to answer on their own any question that does a positive service for your online store. Such technical ability leads to a better customers’ engagement into the store community. For more information please refer to Ask it extension page. We’d like you to know that Argento Flat gives you the complete control over your product page tabs. You are always allowed to customize them via the template’s configuration. One more essential point we want you to know today is the renovated cross-selling block. It is professionally looking and can be tailored to any client wish. Pay attention to the pretty fonts and the modified Customers who bought also bought block. In order to place enough information within less room on the page, we suggest that the customers add the product to the shopping cart using hovering effect. Besides they can add the product to the wish list or compare it by using lovely icons that slide down from the main product image. Both blocks are controlled by powerful Sold Together module. You are allowed to add and manage the related products as well as to change the location of the block with layout XML file and to place the cross-selling block in the shopping cart. By using our extension guide, you will figure out how to use other features of the module. Check it out! Another feature we wish you to notice, is adding of Facebook Like and Share buttons next to the product image. It can be beneficial to engage more customers and as a result to increase the store traffic. Buttons are completely customizable and can be modified by our Facebook Like button extension. You are allowed to change the size and the color of the button by using our Facebook Like button module configuration. You can also change the layout style of buttons. In order to configure various settings of the extension, please navigate the following path in admin: System > Configuration > Templates-Master > FaceBook Like Button. The use of social link to promote your store products is really effective way. Facebook links will surely make your web-page high-converting. We think you will also rate the other value proposition on the product page, such as visually nice swatches. Take it from us, this option is very helpful especially for the store that is running with multiple product attributes. Imagine how surprised visitors could be when they see the product they’re going to add to the cart with all possible colors or sizes. We provide the proper integration with the default magento configurable swatches. You only have to enable attribute swatches for each available product attribute. 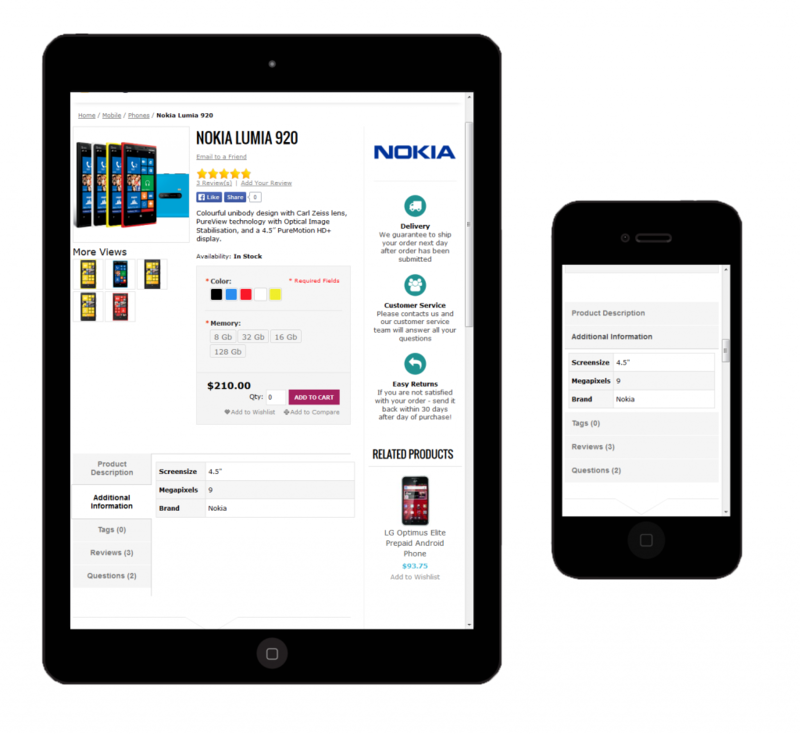 It will allow customers to preview the product and consequently get the best user experience. We hope we helped by offering you new Flat design. Easy to check out the key features of an extremely informative product page. Great list of stuff is quickly loadable so that your customers are immediately able to focus on the product benefits. The earlier users grasp the product, the better the store page conversion will be. Don’t leave things to chance! Stay with us.